From the moment it was published in 1995, Simple Abundance was taken into the hearts of thousands--and soon millions of women, becoming a New York Times bestseller for two years and a classic that continues to inspire new readers. Now, more than ever, we need Simple Abundance. 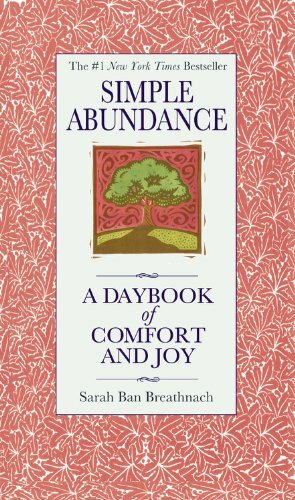 In this daybook of comfort and joy you'll discover 366 evocative essays--one for every day of your year--written for women who wish to live by their own lights. In the past a woman's spirituality has been separated from her lifestyle. Simple Abundance shows you how your daily life can be an expression of your authentic self ... as you choose the tastiest vegetables from your garden, search for treasures at flea markets, establish a sacred space in your home for meditation, and follow the rhythm of the seasons and the year. Here, for the first time, the mystical alchemy of style and Spirit is celebrated. Every day, your own true path leads you to a happier, more fulfilling and contented way of life-the state of grace known as... SIMPLE ABUNDANCE. Embrace its gentle lessons, savor its sublime common sense, dare to live its passionate truth, and share its extraordinary and exhilarating gift with every woman you encounter: the authentic self is the Soul made visible.